Condition: Is the houseboat you want to buy in good condition inside and out? Is there a survey available? Make sure you can quantify the amount of work that needs doing before you buy your new floating home. Layout: Boats come in a variety of layouts, some practical and make good use of space, others not so. Is the boat you are looking for good for space, light and practicality? It can be time consuming to alter layouts dramtically.Make sure it will accommodate your needs. Mooring: Does the narrowboat come with a mooring? Is it residential mooring or leisure only? Bear in mind that leisure moorings do not usually allow you to stay for more than a few days per week. 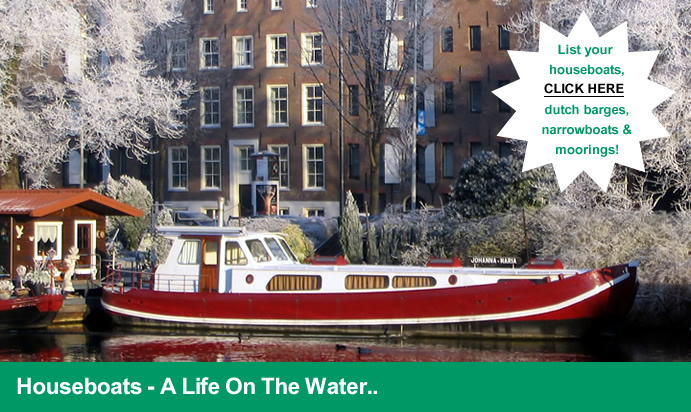 Will your dutch barge be on a mooring in a secure environment? If your floating home is on a residential mooring, is it located next to relevant amenities? What does the mooring include? Can you transfer the mooring and can you put a different houseboat on your new mooring? There are often restrictions on the type of boat allowed on moorings, especially in central London -some have to be tradition narrowboats to keep in with the surroundings. Condition: Make sure you give a good description of the condition so buyers are aware. Include details such as when it was last anti-fouled or if it needs anti-fouling. Include information about the hull, engine and interior. Potential: If the houseboat needs work doing to it, highlight the potential for the boat, if it just needs tlc or it requires more than DIY work. state that this is reflected in the price. Detail: If you are selling a residential/leisure mooring or a narrowboat with mooring, make sure you list details such as location, type of mooring, nearest tube/train/motorway and the various local amenities. Include information such as the charges/fees per month, what is included and details of the transfer rights/type of boat that is acceptable and boat transfer information.